Legend has it that when asked to name the greatest invention in human history, Albert Einstein replied ‘Compounding interest’. Whether Einstein actually said this or not, we would certainly not be one to disagree! In simple terms, the compounding part comes from the interest you earn on the interest you’ve already earnt. As a way of an example, let’s say that one buried $5,000 under their mattress for ten years. At the end of this term it would still be $5,000, no more no less. Only it would very likely be worth a lot less thanks to inflation. On the other side of the coin, say this $5,000 was invested and the interest received came in at around 6%. At the end of year one, the account balance would stand at $5,300. 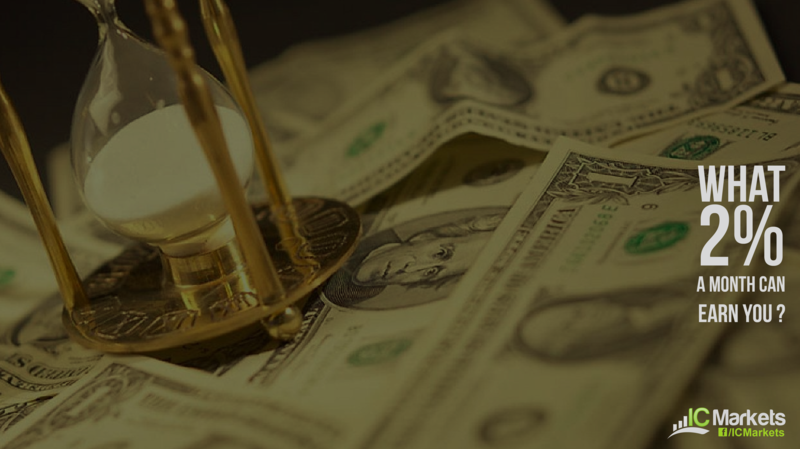 The following year, you’d earn 6% on not only the initial investment of $5,000, but also on the $300 interest you received the previous year. 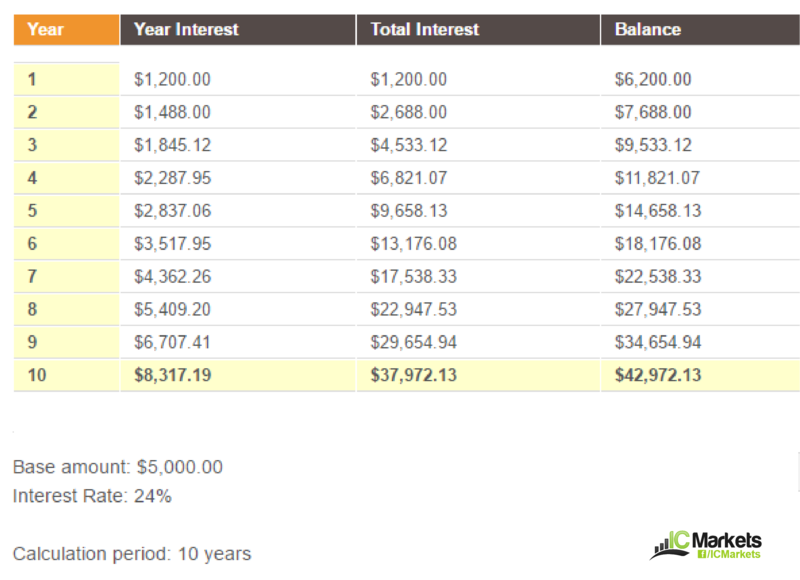 Therefore, by year two, the account balance would stand at a cool $5,618. 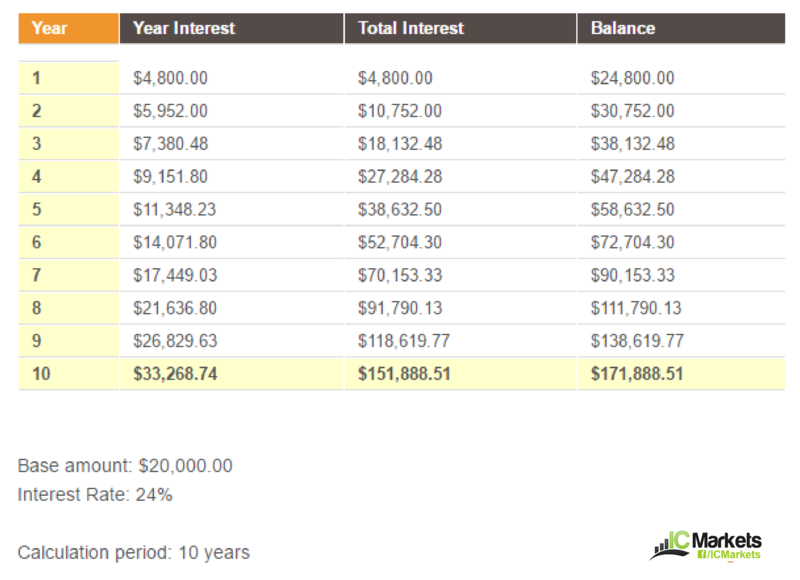 By the end of year ten, the account balance would have nearly doubled at $8,954! 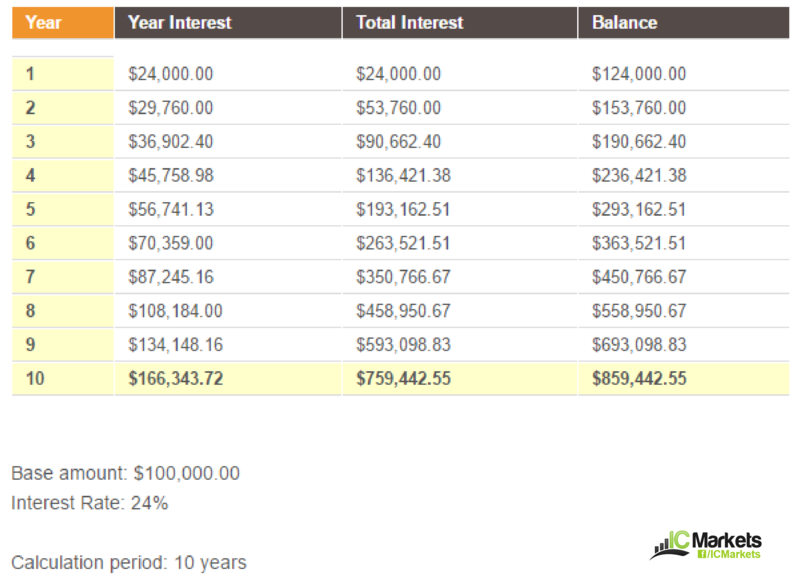 This is the power of compounding interest! Surely this is not enough, you say. What about those investors/traders who net 10% per month? A lot of market participants have different views on what a suitable target each month/quarter/year should be. It comes down to the individual. A trader who has a full-time job may be satisfied with an 8% return on equity per year. Another may require 20% to fulfil his/her needs. Traders, especially ones who are new to the business, often come into the market with unrealistic expectations. Making 10% per month is, of course, possible, but we’ve yet to meet a trader who has proven to do this consistently year-in-year-out. 2% each month may not appear earth shattering to some, but don’t be fooled! 2% earnt consistently each and every month can result in huge gains. Not including inflation, 2% per month equates to 24% a year (an effective annual interest rate of 26.82%). Trader A has an account balance of $5,000. Assuming that all three traders are able to net 24% a year consistently, here’s what their accounts would look like at the end of a ten-year term. It might surprise you! Looking at the above statistics, 2% per month over a ten-year term is, we’re sure you’ll agree, incredibly attractive. Trader A netted over $40,000, Trader B $170,000 and Trader C came in a little shy of $900,000. Calculated using a fifteen-year term, however, trader C would be a multimillionaire and trader B would have half a million dollars! As you can see, one could potentially retire a very wealthy individual. As mentioned above, traders often come into the industry dosed high on excitement, expecting at least 10% per month. This is one of the reasons traders typically abuse leverage. It has been proven time and time again that the best traders target STEADY returns, be it 2% a month, 4% a quarter or even 1% a month! As the statistics highlight, these gains can become exceedingly large through the power of compounding! Will traders always manage to achieve these returns month-in-month-out? Very unlikely. Some traders find it too stressful to think of returns on a monthly basis and prefer to calculate per quarter or even each year. This is where Thinking in Probabilities comes into play. Trading is stressful enough without adding to this pressure by targeting 10% per month. Traders who are making the switch from demo to live should initially focus on the process of trading. Get your mind in the right place before you even think of how much you’re looking to gain. 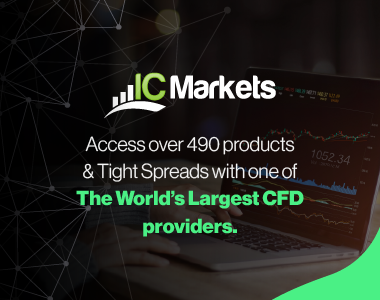 Our advice would be to target 5-10% during your first trading year. That’s less than 1% a month one has to earn to reach this goal. That way, you will likely feel less pressure and wait for only the very best setups.